Robots work in homes every day. Some vacuum floors or mow lawns. Others keep people company. And some help kids have fun! 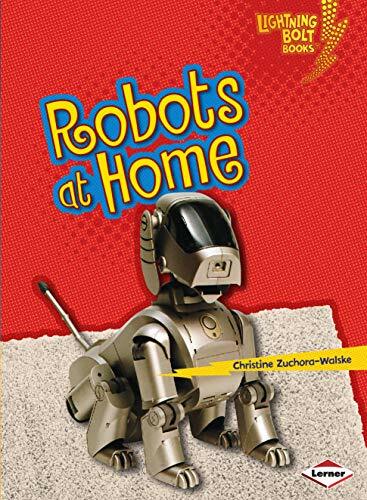 What robots might you find in someone's home? Read this book to find out! Christine Zuchora-Walske grew up―and eventually settled down―in Minneapolis. But as a young adult, she spent some time gallivanting elsewhere, including the University of Notre Dame, London, the University of Denver, and a small town in the cornfields of Illinois. Along the way she discovered a love for reading, writing, and inquiry―and a desire to make a career of those activities. For almost twenty years now, Christine has been writing and editing books and magazine articles for children and their parents. She began as an editor with the Cricket family of children's magazines. She ventured to the Lerner Group next, and then Meadowbrook Press. After having two children, she became a freelance editor and writer. Christine's author credits are many and varied. They include crafts and puzzles; a monthly column in which she impersonated a praying mantis; natural science titles for beginning readers; books exploring countries around the world; a debate on the pros and cons of Internet censorship; and books on pregnancy and parenting. Christine has also edited hundreds of articles and books in many genres and for all ages. Christine is especially fond of science and history. But she loves all kinds of knowledge and literature. She never tires of learning new things, and she gets a kick out of trading knowledge with others.